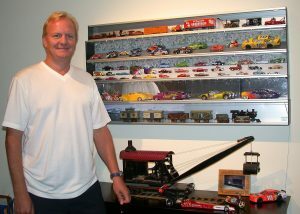 Carl TenBrink has been building models and train layouts since he was a kid. The first one started as a ping pong table that soon grew to over 100 square feet of Railroad Empire with hand built trestles, bridges, tunnels and numerous buildings. Mechanical features were added to add realism to the layout. By turning a rock the cranes on the dock would operate. A barrel next to the road side operated the crossing gates. There was always more detail to be added! After college, Carl started Sonos Models, Inc. (www.sonosproductdevelopment.com) to provide professional quality models to the consumer electronic and medical industries. Then he branched into toys, sculpting and architectural models. Carl maintains 4 layouts at his current place of residence. Starting with an N-scale layout with “Steam and lots of mountain action”. He then added two O-scale layouts, one of which started as a Christmas layout but has not come down for 12 years. The fourth layout is a little bit different from the norm. It is a 7.5” gauge ride-on steam train. Carl enjoys sharing his collection with kids young and old!